Halt’s Peril, John Flanagan’s ninth edition to the Ranger’s Apprentice series, never ceased to hold my attention & kept me on the edge of my seat with its action & suspense. good knight’s sleep,’ ” Will said, smiling at his own wit’. The antagonists, Tennyson, Marisi, and Bacari, could also be seen as real people, as they have no magical powers but still make themselves out to be dangerous. Tennyson runs a cult called the Outsiders religion, a false religion where he promises peace & prosperity to gullible country folk who give him gold to build his ‘altar.’ During these times, villagers always do because bandits operating under Tennyson kill animals & raid villages, but the raids magically stop when Tennyson receives his money. After it stops, people believe that his ‘god’ has stopped it. Marisi & Bacari are assassins that Tennyson has hired. 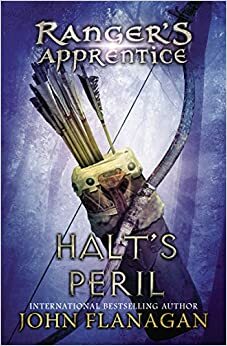 The three protagonists are trying to discredit the cult & turn the people against it, but they are stalled when Halt is critically wounded by one of Bacari’s poisoned crossbow bolts. I love the protagonists, but I found myself hating Tennyson, Marisi & Bacari, and I think this added to the suspense and urgency of the story. In the story, setting changes constantly throughout the book, but it is always well-defined & descriptive nevertheless. Throughout the book, the overall setting is a sort of medieval time, similar to middle earth without magic. The world is divided up into different countries, all of them organized in different ways. Halt, Will, and Horace are from Araluen, a very well-governed country split into fiefs under one powerful & rightful king. Marisi & Bacari are Genovesan assassins, and Tennyson is a nomad. They travel through many countries throughout the book, starting in Hibernia, where they have just gotten rid of Tennyson’s cult. Afterwards, they then move on to Picta where Tennyson & the two assassins have fled, and they continue to pursue him into Araluen. This book was a superb read due to the elements of fantasy, action & suspense, and I would recommend it to anyone who enjoys those three things, as they are constant throughout the book. It kept me on the edge of my seat the entire time I read it, and I could never make myself put it down. To fully enjoy the book, though, the rest of the series before it should be read as it is highly tied into this book. Halt’s Peril is especially tied into the book before it, as this book is essentially a ‘part two’ to that one. Overall, though, I found it to be a fantastic read & one of the best books in the series, if not one of the best books I have ever read.